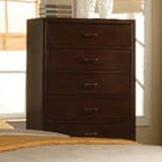 Add this tall and handsome chest to your bedroom for the ideal storage space. With five equal size drawers, you'll have plenty of space for holding your clothes and other belongings. Simple, straight lines and clean edges makes it fitting for any space. The Tyler Drawer Chest by Acme Furniture at Michael's Furniture Warehouse in the San Fernando & Los Angeles area. Product availability may vary. Contact us for the most current availability on this product.